If you are like me and many other entrepreneurs, you know that one of the biggest perks of owning your own business is being able to be completely mobile. You may have an office that you work out of, but if you need to, you can unplug and work on your laptop from anywhere in the world with ease. But this convenience can come at a price to your health. 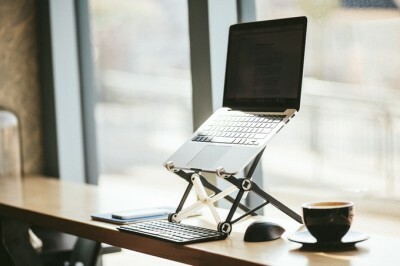 Luckily James Olander, founder and creator of “The Roost” laptop stand, has created a solution for the modern working nomad. Through his personal experience with back and neck problems caused by working on a laptop, James’s ergonomic solution was designed to help laptop users worldwide free themselves from potential injury. Listen in as James explains “The Roost” and “The Roost v2.0” designs, his fabrication journey through laser and 3D printing and his incredibly successful marketing and fundraising campaigns. With James’s help, you can not only correct your posture but learn how to create successful $200K+ Kickstarter campaigns that will help you launch any product. Andrew: Hey, guys, it’s Andrew here, and welcome to the eCommerceFuel podcast. Thank you so much for tuning in today with me. On the show, I’ve got James Olander from TheRoost.com. And James is the inventor of the Roost, which is a laptop stand that gets your laptop off of your desk up to head level so it makes that much easier to use. You’re not always hunched over, looking down. And it’s been a really successful product. James has had multiple six-figure Kickstarter campaigns for two versions of this, the latter of which he’s currently in the middle of right now. And we get into the nitty-gritty behind, of course, how he came up with the idea, but more specifically, how he prototyped his initial one, which is a really cool story. Not quite as intimidating as you might think, which was encouraging to me . . . through everything, with manufacturing, different types that he pursued, whether it was kind of just basic versus injection molding, the whole gamut. It’s an interesting story. So without further ado, I’m going to go ahead and dive in today right into our discussion with James. James, so after fighting via Skype demons, I think we’ve finally prevailed here. Excited to dive into the story of the Roost. So thanks so much for coming on, first of all, and . . .
Andrew: I want to ask you . . . some people, I’m sure, are familiar with it. But for those who aren’t, what’s the Roost? And why did you end up building it? James: Yeah, the Roost is part of a solution that reinvests how you sit at a laptop. The idea is that you get your screen way up off the desk and that your screen’s now at eye level. So it’s not sitting there where you’re hunched over, putting a lot of stress on your neck and on your back. And so the Roost is this portable stand that you then use with a portable keyboard and a mouse to create this ergonomic workstation. It’s actually something I made after living through having really bad laptop posture for a long time. So I was very passionate about finding a good solution for it. And this new Roost is now the second generation of that attempt at solving that laptop hunch problem. Andrew: I think most people understand or have heard of carpal tunnel with the typing. Fewer people, myself included, didn’t really know that there was posture problems with the laptop. What is it that causes so many problems? Is it just the look, kind of having your head tilted down? Is it that somehow leads into the entire posture change? What is it that’s so harmful about using a laptop on a desk? James: Yeah. No, that’s a great question. So it took me three years of going to physical therapists and them basically saying the same thing to me before it finally kind of sunk in. But it’s actually really simple. When you lean forward and when your head is hunched down looking down at the desk, what that does is all of the neck, the muscles and the ligaments that surround your vertebrae, they actually constrict all the nerves that come out of your C4 and C5 vertebrae on your neck. And it’s just like a garden hose. So as you start to constrict those nerve paths, all the signals that go through them start getting kind of haywire. And those are the nerves that go down to your arms and down to your hands. And so completely, the pressure and bad posture you carry in your neck translates then into all the pains and aches you feel further down your body. So if you can fix your posture, then you can fix a vast majority of the problem for that type of thing. Andrew: So the version we’re going to be talking about real shortly, the one you’ve got the Kickstarter for now, is the second iteration of the Roost. But of course you started with v 1.0. Andrew: That first version, how did you build that and prototype it? Were you 3-D printing stuff? Were you cutting it with a welder? I’ve never done something like this, so I’d love to hear the process behind how did you build and prototype it. James: Yeah, totally. I happen to live in an area where I could rent time at basically a machine shop. They call this TechShop. It’s in the Bay Area. But basically, the equipment they have there was what I have to work with. And I found a laser cutter to be super useful because I could . . . basically with a CorelDRAW or Photoshop, you can cut out. You can make line patterns on a computer, and then you literally have prints, and this laser cutter goes and cuts it out of a flat sheet of plastic or wood or whatever it is you want to make it out of. So then it was just playing with all different designs, snapping them together, seeing what would work. And I eventually stumbled on this kind of recipe of a certain plastic that’s called Delrin, and riveting it all together on top of some other more structural components. And that crazy combination of things, I was able to put together into a fairly consumer-friendly version. And so the production was actually made on the same laser cutter as I was doing my prototyping on, which is actually a pretty unique situation when you’re not investing in new production equipment. You can just use your prototyping equipment. Andrew: So you weren’t using some kind of super high-end CAD software to create the prototypes. You were really just firing up more or less a Paint program or Photoshop program, drawing lines, figuring out how many pixels or inches were apart from them, and printing that off, and using a laser cutter to print that off? James: Yes. Eventually though, I got into having the entire product created and constrained and dimensioned within a CAD program, because CAD’s actually a lot easier to manipulate than it is a drawing program, like a Corel or Photoshop. But I literally would create the shapes in the CAD program, translate those to Photoshop, just then saving it in a different file format. And then from Photoshop, you hit print. So the laser cutter cuts out the profiles that you had created in the CAD software. So all of it, I think, is very learnable, for a few YouTube videos and playing around with . . . there’s a lot of free software out there. So yeah, very accessible though. Andrew: That’s so cool. Because I think so many people, myself included . . . that you think about designing your own product and something that’s not… It isn’t even a fabric thing, but something that has hard metallic or plastic parts, and it’s really intimidating. And of course, I’m sure it took a lot of work and learning. But it’s, like you said, it seems fairly accessible if you’re willing to put in the leg work. You don’t have to have a CAD degree or a mechanical engineering degree. James: No, absolutely. And actually, the rate at which this equipment is becoming more affordable is just absolutely crazy. Like what 10 years ago or five years ago would have been a $50,000 machine, now you can get one for like $3,000. And it’s so inexpensive, you could even just have one to play with. And then once you have that, you’ll start learning new ways to do things, new tricks, and all that stuff. So yeah, it’s totally a Renaissance for the maker that wants to be doing that stuff. Andrew: So how much money of your own did you have invested into when you launched your first Kickstarter for the Roost v 1.0? How much money did you have invested, say, in materials, in the CAD work, all that kind of stuff, to get to the point where you were ready to launch that Kickstarter campaign? James: Yeah, that’s a good question. So I guess the whole trajectory is I probably had $10,000. And that’s probably a high estimate, but buying just all sorts of different materials, testing stuff out, paying for the membership at the machine shop. And I had to do a couple of MOQs orders on some of the parts I wanted to do, so I would end up getting like 400 or something when I only needed to test a couple of them. So there were a few cases like that. But then, by the time I launched, I also had a Kickstarter video made by a third party. So that was like $3,000 and $4,000. So by the time I launched, it was probably $20,000 over like a four or five-months period, I would say. Andrew: And were you doing this full time, on the side? James: Yeah, I had a job up until about three months before the Kickstarter launched. Actually, I was either going to go back to school in the fall. And so I was taking a super long break because the Kickstarter launched in June, and I think my last day at work was somewhere in like February and March. And so I was either going to go back to school or something was going to happen with this Kickstarter. So I had three months off. I was working full-time preparing for the Kickstarter. But then before that, I’ve been working probably six months on the nights and weekends with a full-time job on the design. I think, like I said before, all in all, it’s probably a thousand hours of work going into it. Andrew: And it paid off, of course. The first Kickstarter you did was really successful. And do you remember the numbers in terms of the number of backers and dollar amount that it finished at? James: Oh yeah, certainly. It’s probably like your first kiss. You remember all the details. James: Yeah. Oh, it’s so successful. I don’t even remember them. Yeah, it was 2,500 backers, and it raised about $190,000. And the interesting thing is that it was literally half of that until three days before it ended. I got some great press from TechCrunch three days out before it ended, and that just doubled everything that we made in those three days, which is pretty wild. Andrew: And what was your goal for it? I mean, even at $90,000, that’s a great Kickstarter under most people’s standards. So going into it, what was the number where you’ve been like, “If we hit this number, I’ll be happy.”? James: Yeah, the goal was $9500, and that was going to cover these MOQs I was talking about for three or four different components. So I was in the clear if I could hit $9,500 and start making them. But actually, what happened was I was actually in worse shape at $90,000 than I was at $190,000 because the manufacturing complexity, the volumes I would have to produce at $90,000 were high enough to make it that you really didn’t want to use the original hands assembly, hand squeezing stuff, that I was going to use. And so by having the $190,000, I was able to buy some automated riveting machines that made the riveting a heck of a lot easier. So if I hadn’t gotten that higher goal, I think I would have been in worse shape with that $90,000. So I was pretty lucky to get that windfall at the end. Andrew: Okay. That’s crazy. It’s super counterintuitive, but it makes sense. So you launched. You delivered everything, version 1.0. And is this June, 2013? Andrew: Okay, June, 2013. So after you finish the Kickstarter campaign, you got a product that obviously people want and you’re building it. How did you transition into trying to turn that into an ongoing e-commerce business instead of the one-time pop off Kickstarter, segue that into an ongoing business? Was that a pretty easy transition? Was that something where you saw the order flow continue to come through? Did you have a huge drop off? And if so, how did you market that and make that move? James: Yeah. Going into this, for me, intuitively, it’s always been that if the product’s good and useful, people will talk about it. The key factor or key point there being it’s good. There’s so many Kickstarters that deliver really kind of subpar items. And I did everything in my power to deliver the first products in generation as to the best audience I possibly could. That then led to a continued testing of the product being used and we had momentum from there, just from word-of-mouth. After the Kickstarter, I’ve got 3,000 or 4,000 of them out there. Then their friends see them and someone else sees them, so there’s kind of this critical mass of word-of-mouth that I was able to hit. And the only way that would work is if it’s good. So that was where I didn’t really plan it out, but I knew that if the product was good, people would talk about it. And I had some rough numbers that if I were to sell a couple of hundred a month, I could break even and keep the lights on in the business. And so I was able to figure out within a couple of months after selling full-time, that based on just word-of-mouth sales alone, I was going to be able to do this monthly and this typical monthly sales to keep me going. And I couldn’t have predicted that ahead of time. It really was like that was my first measuring point. It was like, “Is this thing really real?” And that was two or three months after I had started shipping and fulfilling. So it really was a long cycle to figure out if it was going to be successful. Andrew: You didn’t have a Kickstarter on 2014. What kind of revenues did you see for the full calendar year 2014? James: So I had the recurring monthly sales and then also a couple of pretty big corporate orders as well. And that, I think it was $350,000, for 2014, in revenue. But the whole time though, it really was kind of an employee of one with a lot of subcontractors. And actually, no. It’s kind of like coming in to that Roost 2.0, my margins really were not high enough on the first product to have room to invest in growth. So even though the revenues were there, there still wasn’t enough margin to invest in advertising and other channels to get the product to grow. So that’s kind of how the 2.0 came about. Andrew: Got it. And last question, then I do want to dive into 2.0 and hear about it more. Andrew: What about patents? You hear from different people . . . of course everyone thinks you invent something, and the next thing you do is you get a patent on it. But I’ve heard kind of differing views, and from some fairly accomplished inventors and entrepreneurs, as saying, “As a small company, especially a small entrepreneur, yeah, you can go get the patent, but how much value does it actually give you?” Because really, a patent is just a license to sue people at some level. If you’re going up against a big company . . .
Andrew: . . . you can take them on, but what about a patent. So what’s your view on that? Obviously, you created something proprietary. It has a lot of value. Did you take the time enough for it to patent it, or did you kind of take that latter approach I described? James: No. Well, I did patent it, but I sort of subscribe now to the latter approach, which, yeah, you’re exactly right. So you do get a patent, which they aren’t going to find out, for two or three years. And the cost really never stop coming to maintain this patent. So you better be in business. You better be bringing in money, or you better have a trust fund somewhere to continue to pay for the ongoing cost of getting the patent then maintaining it and things like that. And then if you ever do have to go after someone, that’s a $100,000 minimum adventure to go sue someone for patent infringement. That’s probably way under what it actually would cost. So unless you are in the seven, eight figures in revenue, you’re going to have a hell of a hard time enforcing anything. Unless you can find lawyers to work for free to enforce it. But it’s kind of an insurance piece if you plan on defending it, or you do it as part of a plan to sell the company down the road. So now you have two or three patents. You’ve got a little product line, and that someone, a bigger fish, it’s easier just to buy you and your IP than it is to try to work around it. That could be another avenue, too. I’m probably going to patent the new one as well. I’ve got that process started, but I’m going to look very hard at what the strategy really is going forward. Andrew: So let’s move into Roost 2.0. Of course, that’s the new and improved Roost, the one you’ve got the Kickstarter campaign running actually right now on that for a really cool product, I ended up backing it. I’m really excited that I get mine in September or October when they ship. But why do Roost 2.0? You mentioned the margins for one thing, but in addition to that, it sounded like people were loving the original Roost. You had $300,000 in sales your first full year for a proprietary product, which is really impressive. Why change that? James: Yeah. The first Roost, the functionality of it, it really was a early adopter product in that, I’ll admit, it’s not super intuitive, super easy to use. It’s not very user-friendly. That was directly a result of the manufacturing process that I used. Because I’m using a laser cutter. Everything’s like a 2-D shape that you snap together, so it ends up looking like this big blocky thing. The only way around that was to go injection molding, and that is a . . . if you’re familiar with the injection molding process, it’s a very capital intensive adventure at the beginning just to get the tools made, so that the margin part and the revenue part . . . The problem is the first Roost took 20 minutes to assemble, which is when you are the manufacturer, I’m then looking at, “Well, if I want to do 1,000 of these things a month, I need to have four or five people.” Well, if you have four or five people doing assembly work, well then, you have to have one person managing those four and five people. And so the scaling of the manufacturing process was just flat not there and not something I wanted to get into. And that was probably even a bigger deterrent than the margin. So yeah. So the going to injection molding, you pay a lot at the beginning, but then the product is much quicker to manufacture. And if you do it right, the unit cost can also be lower, too. So it just made sense to go that route and evolve the product. Andrew: So when you say injection molding, is that what I think it of? For most plastic things, you pay a lot upfront to have a metal mold made. It’s almost like an inverse of what you have. And then you pump in the plastic into that. That one mold, it hardens, and you open it up, pop it out, and do it again and again and again. But the upfront molds are exorbitantly expensive. James: Yes. That is the process, yup. They have machines, stainless steel blocks of metal, and then put them in these huge presses, and then they squirt your plastic in. And then they pull the molds apart, and your part drops out. The cost for that is anywhere from $10,000 at the bare minimum per mold, up to $50,000, $60,000 or more just for one mold that’s going to make one part. So if you have five parts, then you got to have five times that. And the Roost actually has either 13 to 14 molds. So that’s why the startup cost is going to be so high, because we’ve got all those different tools to build at the beginning. Andrew: That’s crazy. So that’s why you have that $400,000 plus goal for Kickstarter that has to be reached, just because you got to cover the cost of all those insanely expensive molds. Andrew: Yeah, that makes sense. So how did the prototyping process differ with injection molding? Was it 3-D printing? I’m guessing . . .
Andrew: With injection molding, you can’t test it until you have the molds. So did you do everything by 3-D printing? James: Yeah, that’s a good question. So I still have the laser cutter. And so I could do functional shapes out of that. Then I made this decision about a year ago to really start the injection molding approach, and to design something for injection molding is a task that should absolutely be left to the experts. So I ended up partnering or bringing on as a contractor a designer who specializes in making things for injection molding. So I would take my laser-cut versions of the Roost, and we would then translate those parts, simplify them into a injection moldable part. And if anyone’s considering going down the injection molding route, I absolutely implore them to work with someone that’s done injection molding before, or otherwise, you’re just going to have a hell of a time. Once you start talking to manufacturers, they look at your part and they’re like, “This thing is never going to work.”And then you’re going to waste a lot of time, unless you work with someone that knows what they’re doing. Andrew: So were you laser cutting before you were using . . . not plastics. For the first original Roost, you were using metal, I believe. So for this one, were you laser cutting out chunks of plastic? And if so, that laser cutter, could it do 3-D cutting or is it just kind of in the 2-D world? So did that also restrict what parts you were able to laser cut? James: Yeah. Sorry, yeah. The laser cutter, yeah, it’s simply 2-D shapes, but you can get creative and make 3-D things out of them. If you just look at laser cut boxes online, you’ll see all these neat joints that people can make to create 3-D shapes. And so I was basically doing that, just out of this Delrin plastic. But once we had a 3-D model of the product, then we did start 3-D printing. And so I, for the last six months, have been 3-D printing prototypes from a whole range of . . . anywhere from $20 a part for what the 3-D print cost, all the way up to $500 or $600 per part, based off of how high a quality of a print I wanted at the time. Andrew: That’s crazy. And so do you have your own 3-D printer maybe for some of the lower level work that you’re doing, those $20 parts? And then you’re probably, I’m guessing, contracting with a super high-end machine for those really high-end ones? James: Right. I don’t have one yet. I would like to get one, but pretty finicky still. So actually, my designer had a 3-D printer in his shop, so we used his quite a bit. And also though, Sculpteo.com is a great website. Pretty quick turnaround . . . you just upload then file, and then two weeks later, your parts arrive. If you want to get high end, then Quickparts. Quickparts is who I use for a lot of the high-end prints where now you’re talking a couple of $300, $400 a part, but the quality is so much higher than on a lower-cost one. Andrew: So what do you do? A $450,000 goal, Kickstarter campaign, it’s really ambitious of course. So what kind of prep work do you do to try to ensure that that’s a success, the groundwork you lay before you go live? Because I’m sure there’s a tremendous amount you did. James: Yeah. Three months prior to starting, I started shifting what I was focusing my efforts on to preparing for that. And so to date, I have probably 10,000 email addresses from customers or potential customers who were . . . like they had emailed me and I didn’t have a Roost that could fit their specific laptop. So I was, of course, collecting those email addresses for the last year and a half. And I knew that when I was going to be ready to launch, I had about 10,000 email addresses that I could hit and have a pretty high conversion rate on that first day of the Kickstarter. And so my strategy was just to go as big as possible on day one and hope that that would then raise the awareness of the campaign that would get the momentum to carry us through. And that sort of has been the case. Andrew: Because right now, we’re recording this on the 18th, I think, of June. It’s going to air on the 26th, Friday, the 26th. And you’re almost there. The goal’s $450,000, I believe, and you’re at $375,000 right now-ish. Is that . . .
James: Yeah, $75,000 is the goal. So yeah, we’re just $100,000 away. Well, it’s funny. Kickstarter, it’s really similar to your e-commerce store in that they now are integrated with Google Analytics, so you can see what the traffic is per day. You can see your conversion rate. And you can see and you can kind of predict pretty accurately the daily figure you have in Kickstarter once things have settled out. So we’re on a trajectory where we’re going to hit the goal in about a week, and then have a few days there once we’re over the goal towards the end of the campaign, which will be great. Andrew: Man, pull out the champagne when that rolls around. It’s going to be huge. Andrew: You spent so much time and energy on this. To see it all come to a head at one point has got to be wild. Are you working with a company that . . . it’s the first time I’ve heard of this, but you’re working with a company that specializes in driving paid traffic to your Kickstarter campaign to help out. How does that work? And is it something that you’ve been happy with? Would you recommend it? James: Yeah, totally. So I didn’t really know this existed until two or three weeks ago. I heard people had advertised for their campaigns during their campaigns, but I never really looked into it. And honestly, I hadn’t planned on using them when I started. So the reason I jumped on with these guys . . . the name of the group is Funded Today, and that’s a pretty small team of kind of young entrepreneurs out of Salt Lake City, I think, or Ogden, Utah. And so I had raised about $250,000 on my own from email and encouraging people to share. But the campaign, it sort of was on a trajectory where we weren’t going to hit the goal. Or it was going to be very close actually. And the scenario for this group that I’m working with now is they take a percentage of what they raise over the whole campaign from the time they joined to the end of the campaign. And they’re basically spending their money doing the paid advertising during the campaign, making sure that . . . they’re going to want to make a cut, too. Then at the end of the campaign, I then cut them a check for the portion that I owe them per the agreement. So yeah, it’s kind of a different world out there now, I think, with Kickstarter. And any campaign that’s done over a couple of $300,000, $400,000 almost, I think, always is using some form of paid advertising, which was kind of a surprise to me. Andrew: And in terms of the cut that they take, is it off the top? Because this has got to be on the amount raised. So what percent did they take of the amount raised that they bring in? James: So yeah. Kickstarter takes about 9% as is. And then the Funded Today guys, they have a range. And I negotiated a amount with them, but it’s going to be between, say, 25% and 35%, 40%. Andrew: Wow. So between the paid and the Kickstarter segment, you could potentially only taking 50 cents on the dollar that you raise. James: Yeah. They came on halfway through the campaign for me, so everything I made before them coming on, I get all of that. But yeah, that’s certainly a very big cut, but to their credit, a good percentage of that take is going to the paid advertisements. And so you’re paying them a fee to perform that service for you, for sure. Andrew: Yeah. Shoot, we should have organized this and planned on releasing this podcast earlier before you brought them on. Andrew: So you wouldn’t have to pay those guys for these. Andrew: Well, for everyone listening, if you haven’t seen James’ Roost, it’s a really, really cool product. Again, like I said, I’ve backed it, and backed it on day one. He’s done an incredible job with the engineering, with the design. James, I was telling you beforehand, “I’m actually going to use on a daily basis.” My laptop right now is on my desk way down. I always got to hunch over and look at it with my two big screens. And traveling a lot of times, I notice, it’s a pain. So I’d really encourage you, check it out. You can go to therooststand.com, which is James’ website. That is his e-commerce site, but it should redirect or have a big call to action to redirect over to the Kickstarter, where you can find out . . . or you can just search on Kickstarter for the Roost. Are those the best ways to find it, James? James: Yeah, that, and then also if you just type in R-O-O-dot-S-T, we’ve got a fun little short domain that goes right to it. Or search us, R-O-O-dot-S-T, and that’ll take you right there. Andrew: Perfect. This isn’t like a crazy insanely priced thing. For the product it is, it’s really reasonable. It’s what, like $59 for a Roost right now, $69? James: Best price ever going to be on there, so yeah. Andrew: We didn’t plan that. That just happened. Yeah, it’s really reasonable. Not to be overly promotional, but it’s a really cool product, so check it out. James, before we wrap up, I got one last question for you. Andrew: What’s been the hardest part of this entire process? It’s easy for people like me who get the product in October, we look at it, we say, “Oh, this is amazing.” We use it, but I think it’s really difficult, unless you’re the founder or the designer, you. So I really appreciate how much work goes into something like this, bringing it to mass market. So what’s been the hardest part of the entire process for you? James: Gosh. I just had this conversation last night with someone. I think the answer is you can only work on so many things at a time. And to give them your full attention . . . and a couple of those things are things that are going to be the difference between you staying in the game or having to go back and get a day job. And having the energy and the focus and the awareness of knowing which problems those important ones are and making sure that you are very attentive to keeping that in check, I think that’s the hardest part. Because if that goes awry, then everything else, the wheels fall off. So yeah, it’s knowing what’s important, and keeping focus on that regardless of whatever else that it might be that you want to work on, of just keeping the goal in mind. Andrew: And what was that for the Roost, in particular? Was it the marketing side? Was it the design aspect of it? What one part of the Roost process did you see as being the most valuable thing you could spend your time focusing on to make sure it was a success. James: It changes, but right now, you’re seeing one of them play out, and that is to produce this new Roost, I need to get this money raised. And if I didn’t do a Kickstarter, it would have had to be a bank loan or something like that. So knowing that in order to keep this whole thing going I had to hit this goal was a focusing mechanism to drive my intention and all my efforts towards that. And then once the Kickstarter campaign’s over, then it’s pretty simple. Like now, it’s to make the products and get the product out and ship. And so just knowing what it is at each time is the most important thing in going forward. That’s what it seems like to me. When I’m not doing that, that’s when things start going a little sideways. Andrew: Again, therooststand.com, R-O-O-dot-S-T, or head over to Kickstarter and search for the Roost. Andrew: James, excited to see you hit that $475,000 mark. I can’t wait to get it in the mail on October, and . . .
Andrew: Yeah. Thanks so much for coming on and sharing. It’s been fun. James: No, thanks, Andrew. I loved it. Thank you. I checked out TechShop which James mentioned ( http://www.techshop.ws). This looks like an incredible place to actual get started on ideas, too bad that most cities likely don’t have such a facility. James, if you’re reading this, could you comment on how instrumental TechShop was for actually giving you the motivation and mentorship to get your idea off the ground originally? Hey David, thanks for note and checking out the Roost!